The Bank of Canada is in the spotlight on Wednesday. The quarterly Monetary Policy Review, monetary policy statement and the governor’s press conference are due, and this time, they won’t be constrained by trade worries. The BoC last raised interest rates in January, a hawkish move, and in the accompanying policy statement they justified the move because of strong data, rising inflation and said the economy was operating roughly at capacity. However, they complained that uncertainty around the North America Free Trade Agreement (Nafta) clouded their outlook. 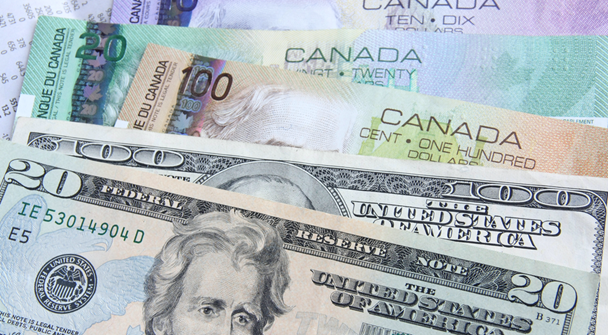 The rate hike was considered dovish, and the Canadian dollar was sold. The March policy meeting reiterated Nafta concerns but included uncertainty about global trade as well. That statement was deemed dovish, and the Canadian dollar was sold. Just as winter has changed into spring, Nafta and global trade concerns have changed from fear to hope. President Trump, the architect of most of the trade uncertainty, has flip-flopped. One week he is levying tariffs on steel, aluminium and $100 billion worth of Chinese imports and the next, he is issuing exemptions and delays. On Thursday, April 12, the president told Republicans that the US and China were negotiating and may be able to avoid a trade war. The improved outlook for Nafta and global trade reduces uncertainties for the Bank of Canada, suggesting monetary policy doesn’t need to be restrained. April 18 may be too soon to raise interest rates, but not too soon for a hawkish policy statement. 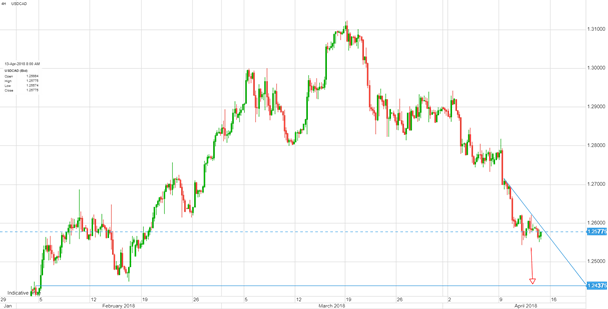 If so, USDCAD support at 1.2450 is a likely target. Monday: US March Retail Sales (forecast 0.3%, ex-autos forecast 0.3%, m/m) are expected to beat the February numbers and underpin the dollar. Tuesday: The Reserve Bank of Australia policy meeting minutes from the April 3 meeting should be a non-event as Australian interest rates aren’t going anywhere for a long while. China Q1 GDP is forecast to rise 6.8% which should support the antipodean currencies. UK unemployment rate is forecast to dip to 4.1% from 4.3% with average earnings excluding bonus (3 months, y/y) rising to 2.9% from 2.6%. The Bank of Canada Policy meeting, Monetary Policy Report and Press Conference will be key for USDDCAD. The improved tone to the Nafta talks suggests a hawkish policy statement, although rates will be left unchanged. Friday: Canada February Retail Sales (0.1% vs January 0.3%, m/m) as the data is stale and too close to BoC statement. Core CPI is expected to be unchanged at 1.5%. Monday: The US dollar posted small gains in Asia and Europe in an uneventful session. Trades war fears abated after President Trump tweeted about his friendship with President Xi Jinping and National Economic Advisor Kudrow telling Fox News “I don’t think there is any trade war in sight.” North Korea got into the act when they reportedly said they were open to talks about nukes. The US dollar lost ground throughout the New York session. Sterling held on to gains from upbeat housing data and expectations for higher UK rates. USDCAD dropped after an upbeat Bank of Canada Quarterly Business Outlook Survey. Wall Street erased nearly all of the day’s gains in the last hour of trading after news that the FBI raided the offices of Trump’s lawyer. Oil prices climbed on fears that rising Middle East tension would impact supply. Tuesday: Chinese President Jinping, remarking about the trade dispute with the US, said dialogue was the best way to resolve disputes. His decision not to escalate trade frictions improved risk sentiment. The US dollar opened in New York with small losses except against the Japanese yen. The trend continued until the end of the day with only the Japanese yen finishing on a down note. Oil prices rallied supported by continued Middle East tensions and hopes of increased demand. Wall Street rallied due to the downgraded trade risks. Wednesday: The brakes were applied to the dollar’s slide in Asia and Europe. Traders were content to await the release of the US inflation report and FOMC minutes. March CPI was lower than expected which caused a brief and limited US dollar sell-off. Then President Trump hit send on his Twitter account. He railed at Russia for threatening to shoot down US missiles with a missile threat of his own. He tweeted again and blamed Democrats for his Russia issues. The FOMC minutes gave the greenback a bit of a bid as they were determined to be “hawkish.” Oil prices continued to rise touching $66.78/barrel after Yemeni rebels launched missiles at Riyadh and Saudi oil storage facilities. None landed. Wall Street finished almost flat for the day. Thursday: The Asia and European sessions were low-key. Australia data wasn’t strong enough for AUDUSD to break resistance in the 0.7780-00 zone. NZDUSD was underpinned by comments from RBNZ Deputy Governor McDermott but stayed in a tight range. USDJPY was supported by BoJ Governor Kuroda promising to maintain stimulus. New York opened with a tweet from Trump downplaying the risk of a retaliatory strike on Syria. The New York FX session was noisy, but when the day ended, prices were little changed from the open. The outlook for global trade took a turn for the better after Trump said that negotiations with China were going well. He also said he would revisit the TransPacific Partnership and that the Nafta negotiations were going well. Friday: USDJPY, AUDUSD and GBPUSD extended overnight gains in early New York trading. The rest of the G10 majors are close to flat in an uneventful Friday session.